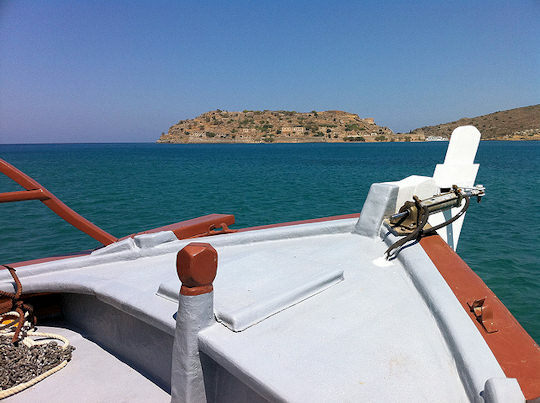 Lassithi Crete - the eastern region of Crete island in Greece is named Lasithi Λασίθι or Lassithi. It is home to mountain ranges, hundreds of beaches, gorges and plateaux, towns and villages, with plenty for the visitor to explore. This land with a rich history is the lesser-known side of the island, with wide open spaces, fresh air and natural places. Agios Nikolaos is the capital of this region. There is a large harbour with ferries servicing the Greek islands, behind the port there is a pretty harbour town surrounding a lake known as Lake Voulismeni. The steep sides of the town lead down to the harbour, creating a natural bowl around the lake. 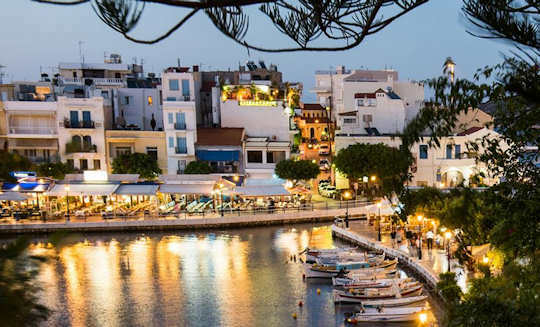 See more information about Agios Nikolaos here.. The town of Ierapetra is located just 36 km from Agios Nikoloas in Lasithi, this town is easy to access via the national roads and on the very handy KTEL local buses. 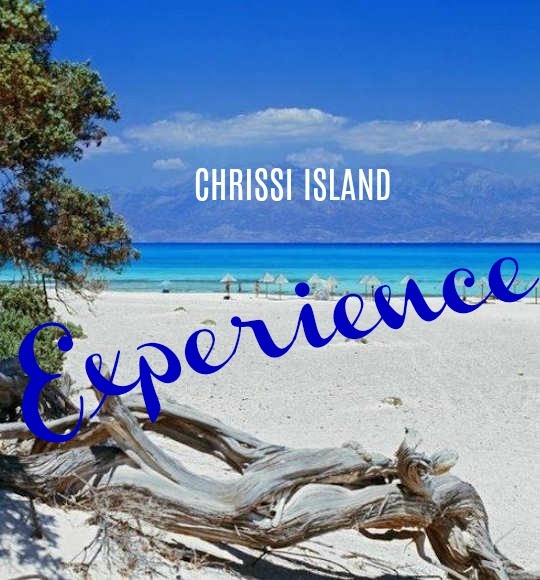 This town is a well-loved holiday destination itself, with many fine beaches, a ruined Venetian fort, a seaside esplanade, historic museums and lots to explore, it is also the port for visits to Chrissi Island. 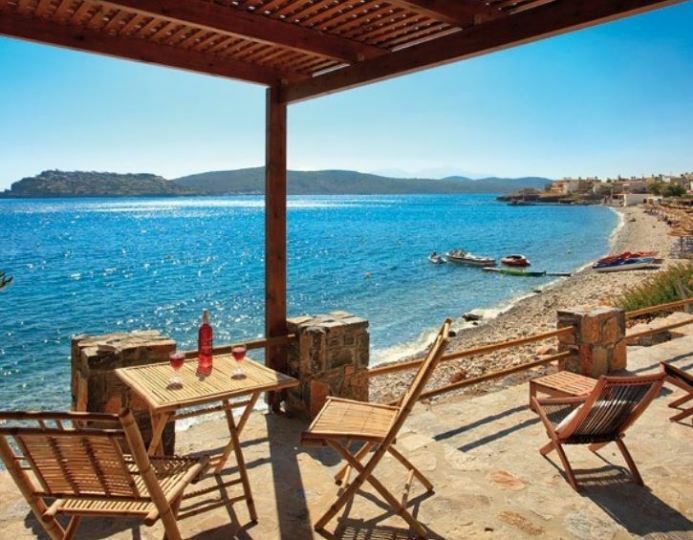 Located 61 km from Sitia, this small town provides everything you need for a break. Do visit the coastal tavernas for a fresh seafood dinner whilst watching the sun set down over the Libyan Sea, gazing metaphorically to Africa. 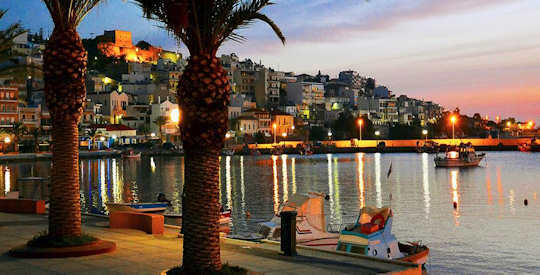 Sitia sits on the north-east coast of Crete, it has a large port servicing Karpathos and Rhodes, and a local airport with flights to major Greek cities such as Athens and Rhodes. The area has a thriving olive and wine growing culture, with excellent quality virgin olive oils and many wineries to visit. The town retains its Greek character; the large harbour is ringed by tavernas and cafes. Toplou Monastery or Moni Toplou Μονή Τοπλού is located 15 km east of Sitia in Lassithi Crete. 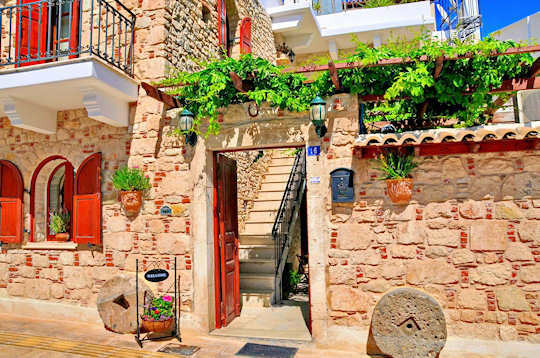 This historic settlement has a rich story to tell, woven with the tales and fates of the Cretan people. 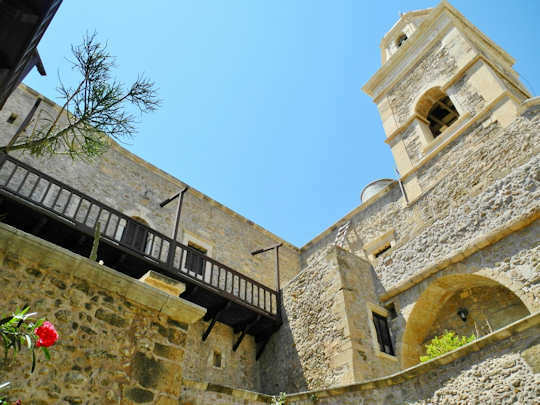 Open for visitors today, and still a renowned religious centre, this is a fascinating insight into the history of Crete, an essential part of the religious, political and cultural fabric of the region. The full name is Monastery of Panagia Akrotiriani and Agios Ioannis Theologos. It houses important collections in a museum of icons and copper engravings. The displays include icons of great artistic worth, bibles, gold-plated silver crosses, patriachal documents, lead seals and vestments. Dating from the mid 1400s, the extensive buildings and grounds are built with strong fortifications, telling of the defensive stance required to fight off pirates, corsairs and plunderers such as the Knights of Malta. 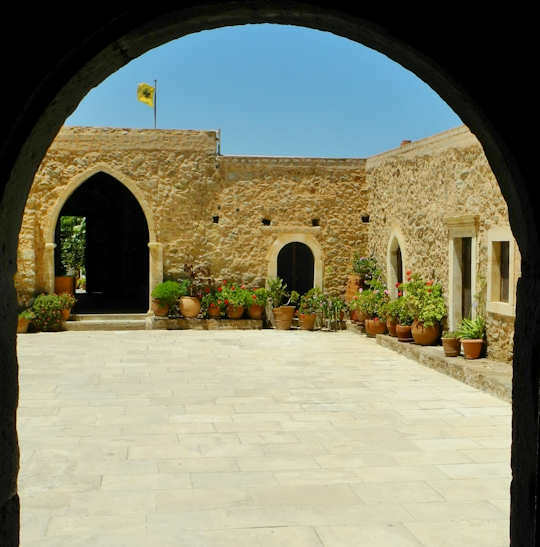 In more recent independence struggles, the monastery played an important part, defending Crete against invading Turkish forces and maintaining resistance against Turkish occupation, with violent consequences. 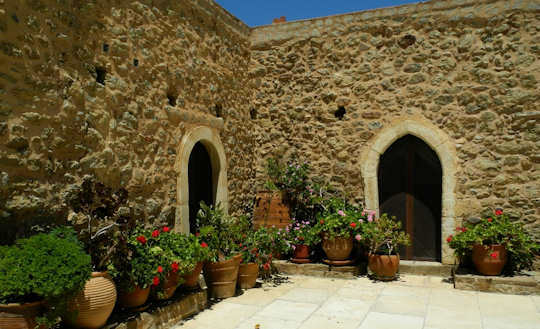 Modern visitors will be interested in the organic wines and olive oils, made by the monastery on its extensive properties throughout eastern Crete. Wine-making is a tradition here that is over five centuries old, and the current Abbot has a firm dedication to biological production techniques. Take a tour of the wine-making facilities hosted in both Greek and English then enjoy a tasting in the tasting room of stone and wood, blended perfectly with the surrounding environment. Enjoy local delicacies whilst you taste some good wines, try graviera cheese, feta cheese, olives and rusks with tomatoes. Also produced here are tsikoudia or wine spirit, olive oil and honey. Chrissi or Χρυσή means 'golden' and refers to the stunning sand on the beaches of this islet. This small, uninhabited, low-lying island is 7 km by 2 km and only 30 metres, at its highest point. The rocky island has many beaches visited from spring to autumn by water craft and tour boats. 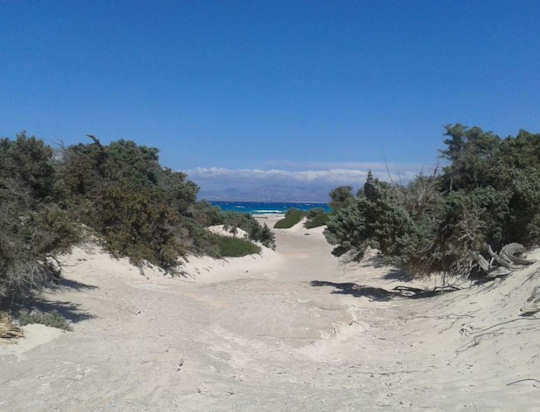 Explore the forest, the Minoan ruins, the little chapel or just laze, snorkel, doze, swim, float and dream your way through the day in the sun. From town accommodation, holiday homes, small guesthouses and beachside resorts, there are many options for staying in Lassithi. We have our selections below. The Cretan Villa Hotel is in the centre of Ierapetra town with easy access to the port for a day trip to Chrissi Island. 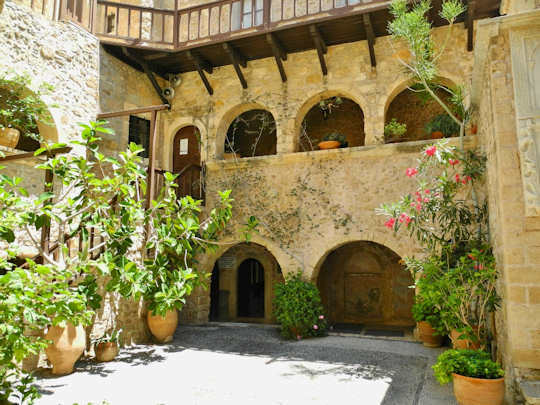 A restored 18th century building with loads of character makes the perfect base for exploring eastern Crete. This hotel is 550 m from the Chrissi Cruises ticket office and departure port for the daily cruises. 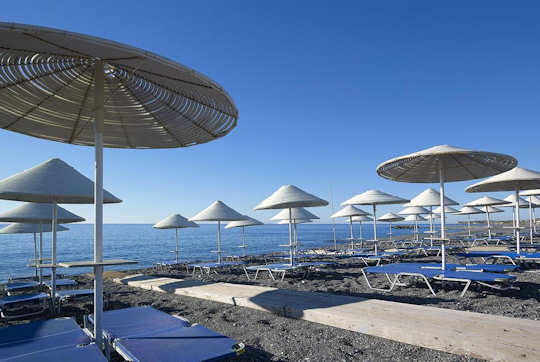 The beachside location of Villa Plori means you can just stroll from your hotel directly onto the sandy beach of Makrigialos, 26 km east of Ierapetra. This is a good budget hotel perfect for families. Coriva Beach Hotel and Bungalows in Koutsounari with direct access to a lovely long sand and pebble beach is a peaceful haven with its own large pool, and Pegasus Seaside Restaurant and bar by the beach. 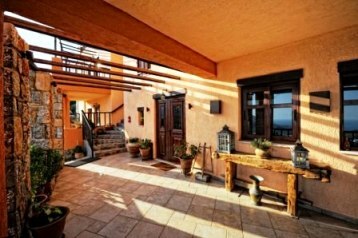 9 km east of Ierapetra, this is a quality hotel ideal for a couple's holiday. 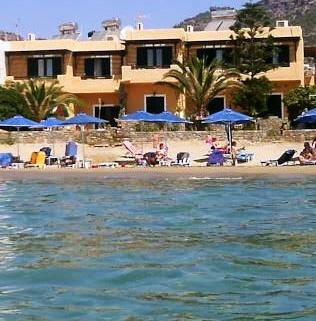 With a day spa, free parking and easy access, this makes a wonderful choice of accommodation close to Chrissi Island.